I had several goals for myself this summer, and one of them was to focus on getting back into shape. As I mentioned in my last post, I started doing Insanity about a week and a half ago. It’s an amazing cardio workout: one that’s supposed to be done 6 days a week. Last week, however, I was given the opportunity to try out and share my experiences with the Nike Training Club App, so I decided I would do both! The NTC app is free and offers 4 different programs. Because I am getting my cardio workouts by doing Insanity, I chose to do the Get Focused part of the NTC app. The Get Focused workouts are each 15 minutes long and they target specific areas of the body. Since I access the workouts through my iPhone, I can do the workouts in any room of my house that happens to be convenient. The equipment required is minimal (it’s stuff like a medicine ball, which I already owned) and I love that the workouts are so short: I’ve been combining 2 on the days that I use the app. So my current workout schedule looks like this: Insanity 4 times/week (~40 minutes) and 2 NTC Get Focused workouts 2 days/week (~30 minutes). A rest day is really important so I make sure there’s one day per week that I do NOTHING. I look forward to reading more about this app. 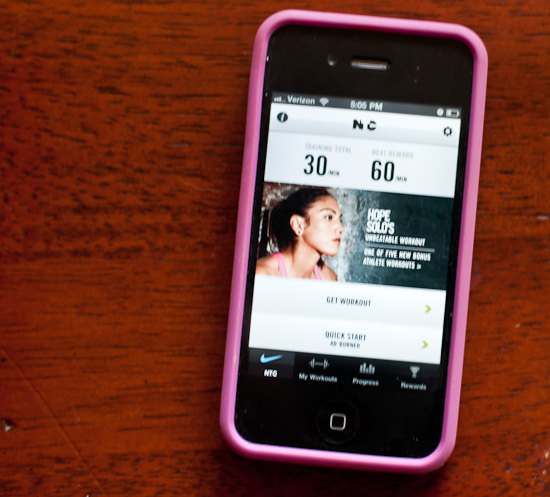 I read about it in the Nike+ website and sounds awesome. Unfortunately, not being a techy person, I dont have an iPOD touch or an iPAD. But thinking about getting one to get this app. I am going to wait and see how you like it. I know it was so long ago but I wonder what weight medicine ball did you use for NTC workouts. I’m thinking about buying one and don’t know if 5kg won’t be too much for me.